It’s no surprise that Tulsibaug is every Pune-ite’s answer to affordable shoes and clothes. But, did you know this old street is also a treasure trove for wonderful and unique home decor pieces and accessories? We spent about five hours out here and here’s everything we found for as low as INR 10. Turn your PG room into an adorable space with colourful durries and quirky cushions from Kapde Ka Khazana Kilo Par near Kaka Halwai at Tulsibaug. 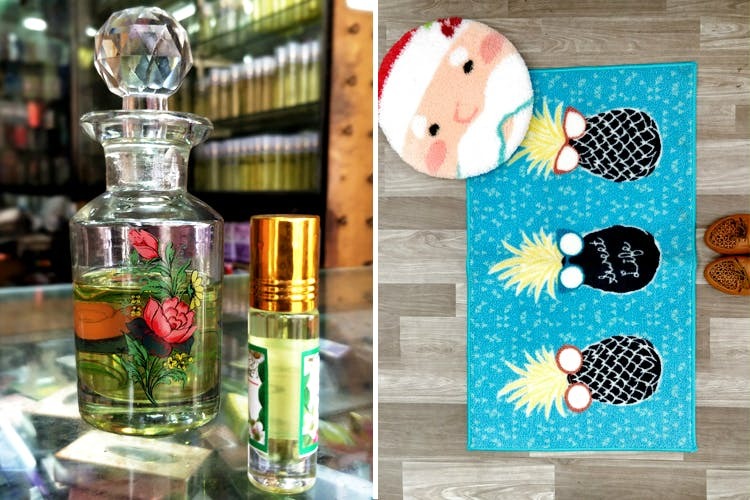 We got our hands on a cute aqua blue durrie with pineapple print for INR 280 and an ultra-soft Santa Claus cushion for INR 100. This makes us so happy! #LBBTip: The durries out here are priced at INR 400 per kilo and come in multiple sizes. Designs is a small hole-in-the-wall shop, opposite Mumbai Tea Company that sells an array of beautiful chemical-free ittars, derived from botanical sources. We picked one for INR 50 and it literally smells like freshly cut summer roses. Head to KJL Gurukripa Handicrafts at Tulsibaug if you’re hunting for the quirkiest antique miniature pieces. From teeny tiny vintage cars to kettles and keys, they’ve got it all to make for a perfect gifting option. We bought a 4-cm miniature clothe iron in brass and white gold for INR 200. We also found an elegant Buddha statue for just INR 10, that probably wouldn’t be more than an inch tall. Cute, isn’t it? Move over Osho sandals and flip-flops, we found the coolest wooden paduka sandals at Rameshwar Chowk. What’s more? The insoles have multiple massage beads that help in blood circulation and relaxation. This shop is located right at the beginning of Tulsibaug and is a home decor haven for all things handmade, pretty and affordable. We bought a beautiful crocheted hanging mirror in yellow and blue for INR 350. You can also get your hands on round crocheted wall mirrors in red, hot pink, blue, purple and more. Tulsibaug is a treasure trove when it comes to gorgeous wind chimes with colourful birds, bells and more; the street is full of ’em. We, however, came across this very cool wind chime with minitaure Eiffel Towers on it, for just INR 150. Bored of same old fairy lights? Amp up your walls with these disco ball fairy lights from Flower And Pot. Priced at INR 500, a packet comprises six balls in shaded of pink, red, blue, yellow, green and silver. #LBBTip: They also had pretty watering cans, bird cages and earthen flower pots. No, they are not your usual saree pins with tiny stones. Ace your bling game with these huge pins with bold designs, embellished with gems and glitter from Laxmi Jewellery, starting at INR 50.